Authored by three renowned experts in microwave engineering, this book describes in detail a number of modern multi-modal techniques for the analysis and design of passive microwave components. 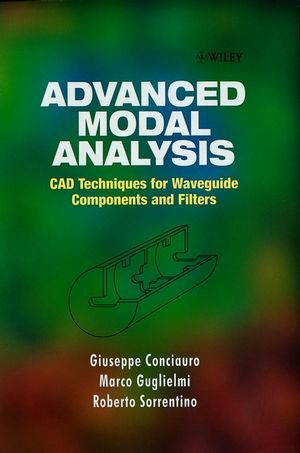 It comprehensively covers modal analysis of waveguides and cavities; discusses several multi-mode procedures for the study of both basic and arbitrarily shaped waveguide junctions and finally, describes specific applications such as inductively coupled filters, waveguide couplers, metal insert and dual-mode filters. The book will be of interest to professional engineers and researchers in the microwave engineering field as well as students engaged in research at an advanced level. Giuseppe Conciauro and Marco Guglielmi are the authors of Advanced Modal Analysis, published by Wiley. Electromagnetic Field Expansions in Waveguides. Mode Matching Analysis of Planar Discontinuities. Modal Analysis of Three-Dimensional Microwave Structures. Wideband Modelling by the BI-RME Method. Alternative Computation of Admittance Parameters. Advanced Modal Analysis Download three code samples to run analyses discussed within the book.